The Saloon Pilots are: Lesley Kline on fiddle, Paul Sato on banjo, Kilin Reece on guitar, and Mark Ransom on bass. All are seriously talented instrumentalists and vocalists, and they have worked up spectacular harmonies and truly astonishing new arrangements of the most surprising material. This band never, ever disappoints! The Saloon Pilots have developed some impressive credits, including opening performances for Laurie Lewis and Tom Rozum, Rhonda Vincent and The Rage, the Alison Brown Quartet, Pete and Joan Wernick and Ken Emerson, and Rob Ickes, Tim Stafford, and Ledward Ka`apana, and--in 2007--a fantastic performance with the Honolulu Symphony Pops, opening for Wynonna Judd at Honolulu's Blaisdell Concert Hall. They have also appeared live on Hawaii News Now's Sunrise program as well as KHON TV's Wake Up 2Day, and a number of popular morning radio programs. They have even performed for delighted audiences in North Carolina! Before moving to O`ahu in 2003, fiddler Lesley Kline played bluegrass and mariachi music in Paris for a decade. Paul Sato has been a mainstay banjo picker in the Hawai'i bluegrass scene for many years, and was even one of Bill Monroe's Bluegrass Boys for a couple of days. Guitarist Kilin Reece, who has worked with legendary fiddler Byron Berline, is a well-known, versatile musician who played in bluegrass bands in Oklahoma and California before relocating to Hawai'i. Mark Ransom is a longtime performing musician who has provided his tasteful bass-playing skills to a varied array of musical genres. Click HERE for a February 2007 article about the Saloon Pilots from Honolulu Weekly. Visit them on Facebook for information about their activities and upcoming gigs: http://www.facebook.com/pages/Saloon-Pilots/119319381419701. And don't forget: you, too, can hire the Saloon Pilots for your private (or public) event! They can perform in several different capacities, ranging from traditional good, clean family fun to contemporary loud, and low-down. They can also provide a professional sound system, and even teach your guests how to square-dance! Contact Paul at paulsato@hotmail.com. The North Shore Ramblers are Jeb Wiemer on guitar and mandolin, Neal Snyder on guitar, Virginia Hayes on fiddle and Bob Hayes on bass. The vocals get tossed around amongst the group. The Ramblers play mainly bluegrass and enjoy mixing in a bit of Hank, Dylan, the Band, etc. anything to get the audience tapping their toes and having a good time. The North Shore Ramblers share the idea that music is fun! For more information about the North Shore Ramblers or to schedule a performance contact Virginia Hayes at ginrose55@live.com. As Jan Caneen tells us, "This little group formed this past summer as a result of several of us talking about wanting to play for elderly residents in retirement centers/nursing homes/hospitals etc.... just to give some community service. Most of us were from the Half-Fast jam group. Luckily several more experienced musicians agreed to come on board and mentor the rest of us. Our goal is to play at a different facility once a month. We have been helped immensely by other Bluegrass Hawaii musicians and are very grateful to them for their support. This has been a lot of fun, given us opportunities to grow and learn in our music, and hopefully spread the bluegrass love to folks less fortunate than ourselves." For more information contact: Jan Petty Caneen, Jan.Caneen@gmail.com, 808-457-2777. The Celtic Waves play a lively blend of traditional jigs and reels with a sprinkling of slow airs and songs that lend an Irish pub feel to the music. Performed on acoustic instruments, their repertoire ranges from rollicking, newly composed tunes to lyrical 17th-century harp compositions. Band members include Clark Ratliffe on Irish flute and whistles; Katie McClellen on harp, mandolin, whistle, and vocals; Lawson Cannon on guitar and vocals; Susan Reinhart on bodhran, African Djembe, acoustic bass and vocals; and Kevin Craven on fiddle and vocals. They are sometimes joined by fiddler Lisa Gomes. The Waves appear regularly at several venues on O`ahu! Visit their website and find out where they're appearing at http://celticwaves.net/. For bookings, contact Clark Ratliffe at clark@celticwaves.net. 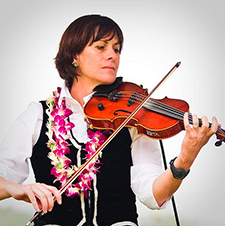 Her awe-inspiring career as a fiddler for hire has taken her all over the world, but lucky for us, LISA GOMES calls Hawai`i her home! Lisa grew up near Woodstock, New York, playing classical music. After graduating from Vassar College with a degree in psychology, she bought a one-way ticket to Taiwan to learn Chinese. While prepared to learn a new language and culture, she ended up learning something unexpected - how to play music by ear! Lisa has successfully played in several genres of folk music, including Irish, Scottish, French, Klezmer, Cajun, blues, and rock. Her performances now include dancing and fiddling for the JigThis School of Irish Dance, Highland Dancers Hawai'i, and The Society of Creative Anacronism (SCA), Barony of the Western Seas. In Honolulu, she has played with The Bones (rock), Irish Hearts, Bon Ton Roule (Cajun/Zydeco), The Swampshakers (Zydeco), The Pleasant Peasant Band (International folkdance music), Sherele (Klezmer), Scott Wallace and The Round-up (country), as well as as a duo with Two Hearts (Irish) with Curtis Vandeloop (opening for Old Blind Dogs in 2004); as Kilts on the Beach (Scottish) with Audrey Knuth (opening for Alasdair Fraser and Natalie Haas in 2007); and with Jo McGarry (Scottish music and Scotch-tasting)! She has also guested with the Doolin' Rakes, Celtic Waves, The Honolulu Blues Co-op, The Eric Petersen Band, Gordon Freitas and Local Folk, Don Conover's Irish Band, The Southern String Band (Raleigh, N.C.), Wolgemut (Medieval), Dram (Medieval/Swedish), and Switchback (Irish/Scottish). Those of us who know Lisa well are fairly sure she never sleeps! Check out her website and schedule at www.lisagomes.com. He's a local folk troubadour... a guitar slinging songwriter, storyteller, historian... and a world-traveled sailor. Gordon's music reflects a sincere joy in the spirit of aloha, and deep pleasure in sharing his island culture with the rest of the world. He can invariably be caught flying solo, in a duo or with close musical friends in a group he calls Local Folk. Gordo swings from traditional Hawaiian to classic folk & rock, but he loves bluegrass and welcomes any opportunity to kanikapila (play music)! Visit http://gordonfreitas.com to learn more about Gordo, his songs and schedule, and email him at ainafolk@aol.com. 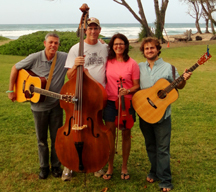 Bluegrass Jack is a new musical group on the Big Island consisting of Jack Tottle, Anne Pontius, Lala Power, Steve Ryan, and Chris Wej. It currently performs bluegrass music on the first Saturday of each month from 11:30 AM to 1:30 PM at the Nanbu Courtyard Cafe in Kapa'au in the North Kohala community. The organizer of the group - mandolinist, singer and songwriter, Jack Tottle - is the recently retired founder and director of East Tennessee State University's Bluegrass, Old Time and Country Music Program in Johnson City, Tennessee. Among Jack's many successful former students are country music superstar Kenny Chesney, and present and former members of Alison Krauss and Union Station. Previously Jack Tottle's band Tasty Licks provided the first professional performing and recording experience for several talented musicians including banjo prodigy, Béla Fleck. Jack has written numerous articles for national music magazines and is also the author the best-selling instruction book, Bluegrass Mandolin. His most recent CD, The Bluegrass Sound - which also features among others Tony Rice, Jerry Douglas, Tim Stafford, Stuart Duncan, Ron Block and Del McCoury - consists entirely of Jack's own compositions. It has been reviewed enthusiastically by publications across the United States and internationally. The other members of Bluegrass Jack are singers and guitarists Anne Pontius and Lala Power, U-bass player Chris Wej, and banjo player Steve Ryan. Anne plays guitar and mandolin and enjoys singing harmony. Lala, a resident of North Kohala for twenty-five years, has been a music teacher at Kohala Elementary School, a member of the Almost Acappella singing group and director of the North Kohala Community Chorus. Chris has retired from the environmental contracting business he founded on Oahu thirty years ago. Steve, a retired environmental scientist, has worked as far north as Alaska, as far south as the South Pole and, more recently--for twenty-two years--on Mauna Loa. The group performs primarily songs and instrumental pieces written by Jack Tottle as well as traditional bluegrass songs. The former include favorites from The Bluegrass Sound and from Jack-s upcoming release, The Eagle. One of the band's favorite pieces, however, has a distinctly local connection. "We love playing 'Kohala March'" says Jack Tottle. "As many folks know, it was written by Henri Berger the founder and first director of the Royal Hawaiian Band. As far back as 1877 Berger conducted King Kamehameha V's band. 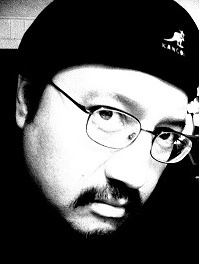 Sol Ho'opi's wonderful steel guitar recording of the piece inspired us to learn it!" Anyone wishing additional information on Bluegrass Jack is welcome to call Jack Tottle at (808) 889-6290. There's a new bluegrass band in town...Kona town. We have regular performance each month: on the 3rd Thursday of each month we play at the Daylight Mind Restaurant from 6 to 9. It's located on the water next to Bubba Gumps. Come join us for some good food and bluegrass pickin'. The restaurant also features lots of crafts where you can purchase crafts from local vendors. Our other regular gig is on the 3rd Sunday of each month called "Kokua Kailua" where they shut down the north part of Ali'I Drive and feature the Big Island crafts and food and music. The music goes all day: 1 pm to 6 pm. We are available for private events and parties. Bluegrass Breeze is L to R: Emile Elliott, Barry Willis, Greg Anderson, Mike Parks. This band has a great time! Personnel includes Paul Crowe on guitar and vocals; Steven Meredith on harp, cajone and washboard; Jimmy Truillo on dobro, harp and vocals, Ya Kaduce on jaw harp, saw, vocals; Doug Gates on mandolin and sound; Mike Cosmann on banjo, mando and vocals. 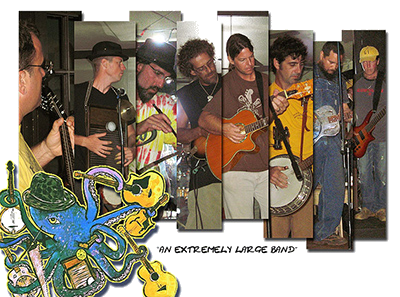 They make regular appearances in Kapa`a, so check out their website (complete with a few very fun tunes!) at http://www.myspace.com/malamaponoallstars. Sand Hill is Maui's newest addition to the Bluegrass community. The all acoustic band play a diverse set of traditional, contemporary, and sometimes obscure tunes ranging from old Carter family and Doc Watson standards to Stanley Brothers and Flatt and Scruggs classics, with some random offerings from The Rolling Stones, Grateful Dead, Steve Earle, etc....all done with a fresh and exciting bluegrass feel. In other words, they play anything that strikes their fancy and can be re-worked into the standard bluegrass format. Whether it be gospel songs, murder ballads, love songs or nonsense songs for square dance, they do their best to "Get it on". The group's current members are Michelle Steuermann rhythm guitar and vocals, Jonathan Clay lead guitar, banjo and vocals, Scott Crockford mandolin, guitar and vocals, and Harry Timmins on banjo, guitar and vocals. The band members hail from all corners of Maui, and are as diverse a group of individuals as you'll be likely to meet, (a farmer, a construction worker, a real estate broker, and a Pastor), but the love of the music keeps them coming back for more. 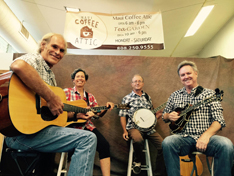 The band currently plays at Ulupalakua ranch store, the Maui coffee attic, and a monthly jam called "Pickin with Chickens" located at Rainbow park in Makawao. For more info, or to book a concert, party, jam or dance please contact Michelle at tipsam3@gmail.com or Pastor Harry at pastorharry2@gmail.com. The Haiku Hillbillys are a Maui band that play regularly at several locations. As guitarist Randall says, "We travel into many different styles but do some real serious bluegrass within The Haiku Hillbillys." Their material includes plenty of originals, as well as covers of tunes from Old and In The Way, the Grateful Dead, Bob Dylan, and old folk traditional tunes as well as their own originals. To check out Randall's site, click here. Or email Randall and ask him to put you on his mailing list, because the Hillbillys make frequent regular appearances each month at various Maui venues!